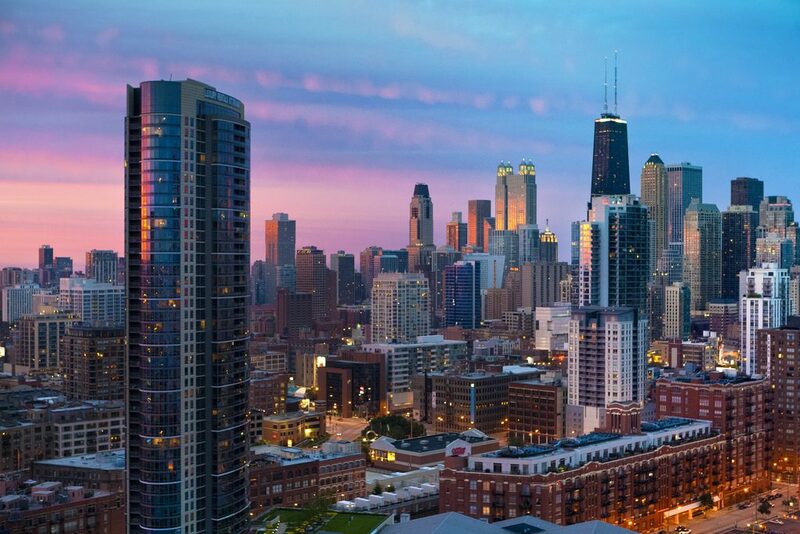 Located right in the bend of the Chicago River, River North has been a center of commerce since the city was settled. Once the home of Chicago’s very first businesses, it’s now a hotbed of swank offices, hotels, restaurants and museums that really draw in tourists. But full time River North dwellers are never at a loss for great places to shop, relax and socialize, either. As your trusty River North movers, we’ll help you navigate the busy streets and settle in to your new home, so you can start exploring right away and find your favorite places. Fair warning: choosing may take a while. Almost 15,000 people live in River North today. It’s an even mix of men and women, singles and marrieds, with a sizable number of families, too. The average income is $140k and most adults have bachelor’s degrees. As Chicago was founded in the 1830s, the area that became River North was the site of the first taverns, stores, bridges and hotels. When it was rebuilt after the fire in 1871, it became a largely industrial district. The area became shadier once the 1920s hit, then lost even illegal businesses throughout the 1960s and 70s. But in the mid-1970s, as it was renamed “River North” to invite new interest, the neighborhood began to revitalize. It’s been thriving ever since. Now you’ve got the gist, here are some highlights—and basics—we found to help you start your River North life. Washington Square Park: Historic landmark. Newberry Library: Also historic. Free. Merchandise Mart: Public park space, amenities, and design showrooms. 3 Greens Market: Food, coffee, beer, and hangout space. Museum of Broadcast Communications: TV and radio exhibits. Wendella Boats: Architecture tour or leisurely river cruises. Wateriders: Kayak rentals on Chicago River. House of Blues: Nationwide music venue. The Escape Room: Solve puzzles with a group to get free. After-Words Bookstore: New upstairs, used in the basement. Pizza: Two iconic local chains. Both deliver. Gino’s East: Comedy venue upstairs. Sandwiches: Portillo’s. Chain famous for burgers, hotdogs, shakes, more. Low Key: BIG & little’s. High-end counter service. Japanese: Roka Akor. Sushi and steak. Mexcian: Frontera. Expect a wait. Mexican/Korean: Seoul Taco. Street food and beer. Delivers. Italian: Gene and Georgetti. Old school. Classic. Seafood: Shaw’s Crab House. Two sections, upscale and casual. Brunch: Bridge House Tavern. Patio on the river. Special Night: The Boarding House. Truly fine dining. Cocktails: Three Dots and a Dash. Tropical tiki hideout. Beer: Centennial Crafted Beer + Eatery. Brand new. Bowling: 10Pin Bowling Lounge. Ping pong and pool, too. Ping Pong: SPiN. Swanky ping pong. Reserve tables in advance. Arcade: Headquarters Beercade. Games are free. Music: Howl at the Moon. Dueling pianos. Dancing: Studio Paris. A go-to nightclub. Intimate: Broken Shaker. Artsy space and tasty menu. Jewel Osco: Right off the Red Line. Trader Joe’s: Ask for parking validation. Whole Foods: May be busy at peak hours. Starbucks: Four locations and counting. Bow Truss Coffee Roasters: Coffee only. Fabcakes: Coffee, lunch and dessert. Cafe Integral: Next to Broken Shaker, above. River North Gym: Equipment and classes. Expanding. ENGRi Fitness: Group fitness focus. East Bank Club: High end city club with full amenities. This has been a tiny sampling of the great things you’ll experience at your new River North home. As a seasoned River North moving company, we’ve learned all about the staples and cool places in the area. We’re happy to share more! As you’re planning your big move, cross one major thing off your to-do list, and book River North movers who’ll a take load of stress off your mind. Call us at New City Moving, and we’ll help you move safely, smoothly, and on-schedule, so you can settle right in and start living your greatest River North life.